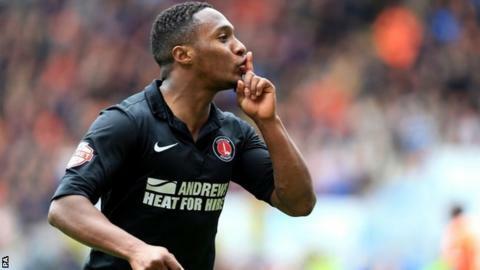 Blackpool survived relegation despite Callum Harriott's hat-trick securing Charlton a third win in four games. Harriott, who also scored twice in the 3-1 victory over Watford on Tuesday, slotted home to put the Addicks ahead. The 20-year-old added his second of the afternoon after being teed up by Jon Obika, before adding a late third. Blackpool, who started the day in 19th place, finished the season two points above the relegation zone as Doncaster lost and Birmingham drew. It was a close shave for the Seasiders, who were in the Premier League three years ago. In a turbulent season, manager Paul Ince was sacked in January, with caretaker-boss Barry Ferguson having won just three of his 20 league games in charge. But they started the final game knowing a point would be enough to guarantee safety. And they started brightly, with Stephen Dobbie forcing keeper Ben Hamer to tip his 13th-minute shot behind. Defender Craig Cathcart then headed Tony McMahon's free-kick over as the hosts created the better chances before the interval. But Harriott's clinical finishing proved the difference. The former England Under-19 international opened the scoring in the 61st minute with a neat finish before completing his hat-trick with two goals in the final eight minutes. His second, a left-footed strike after brilliant work from Obika, gave keeper Matt Gilks no chance. And the Norbury-born winger completed his hat-trick in the last minute, latching onto Joe Pigott's pass and firing low to the left of Gilks. "It's a strange day because we should be really happy keeping the club in the Championship. "But I just wanted the boys to go out on a high. "This isn't the way I wanted to finish it." "I asked my players to end the season with a good feeling and they were able to do it." "He has speed, he has pace and it's more a question of trying to manage his emotions. "Everybody knows that he has talent." Match ends, Blackpool 0, Charlton Athletic 3. Second Half ends, Blackpool 0, Charlton Athletic 3. Goal! Blackpool 0, Charlton Athletic 3. Callum Harriott (Charlton Athletic) left footed shot from outside the box to the bottom right corner. Assisted by Joe Pigott. Attempt missed. Davide Petrucci (Charlton Athletic) left footed shot from outside the box is high and wide to the left. Davide Petrucci (Charlton Athletic) wins a free kick on the right wing. Substitution, Charlton Athletic. Joe Pigott replaces Marvin Sordell. Offside, Charlton Athletic. Dorian Dervite tries a through ball, but Callum Harriott is caught offside. Callum Harriott (Charlton Athletic) is shown the yellow card for excessive celebration. Goal! Blackpool 0, Charlton Athletic 2. Callum Harriott (Charlton Athletic) left footed shot from the centre of the box to the high centre of the goal. Assisted by Jonathan Obika. Attempt blocked. Marvin Sordell (Charlton Athletic) right footed shot from the centre of the box is blocked. Assisted by Lawrie Wilson. Diego Poyet (Charlton Athletic) wins a free kick in the attacking half. Foul by Ricardo Fuller (Blackpool). Attempt missed. Anthony McMahon (Blackpool) right footed shot from outside the box is close, but misses the top right corner from a direct free kick. Davide Petrucci (Charlton Athletic) is shown the yellow card for a bad foul. Neal Bishop (Blackpool) wins a free kick in the attacking half. Offside, Charlton Athletic. Dorian Dervite tries a through ball, but Astrit Ajdarevic is caught offside. Foul by Harrison McGahey (Blackpool). Attempt missed. Craig Cathcart (Blackpool) header from the centre of the box is too high. Assisted by Anthony McMahon with a cross following a set piece situation. Isaiah Osbourne (Blackpool) wins a free kick on the right wing. Attempt missed. Chris Basham (Blackpool) right footed shot from the left side of the six yard box is just a bit too high following a corner. Substitution, Blackpool. Ricardo Fuller replaces Andrew Keogh. Corner, Blackpool. Conceded by Dorian Dervite. Attempt blocked. Neal Bishop (Blackpool) right footed shot from the centre of the box is blocked. Assisted by Andrew Keogh. Substitution, Charlton Athletic. Davide Petrucci replaces Jordan Cousins because of an injury.